Wes and I celebrated our four year anniversary on the 14Th of August. (We did not do anything because we weren't together. My mom moved to Utah and I had to go help her. Boo Jana. (Wes's words). When I got back we went to dinner at our favorit sushi restaurant Mikunis (www.mikunisushi.com) . I am so grateful to have Wes he is my best friend, and my strength. Here are some of my favorite pictures of us over the past 4 years. Will Landon ever figure it out? I am sure many of you moms have one of these toys. You push the big red button at the top and air pushes up through the tube. 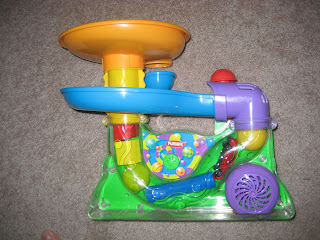 The idea is to put small plastic balls into the conveyer, watch them travel down into the tube, and fly back through the top as the air pushes them up. My son, however, has no concept of this. Instead, as you can see, he shoves blocks, cars, and any other toys that will fit down the tube plugging up the whole system. Once the tube is backed up, the toy makes a horrendously loud buzzing sound which scares the crap out of Landon. He runs away and the toy is left battered and broken. This is one of my favorite things in the world. Landon sitting still. 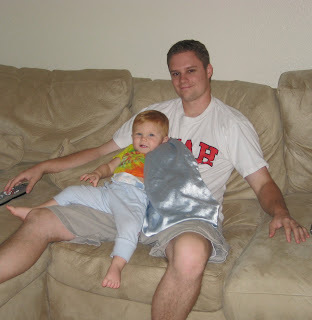 He and his daddy are having a nice time watching the Giants lose, again. 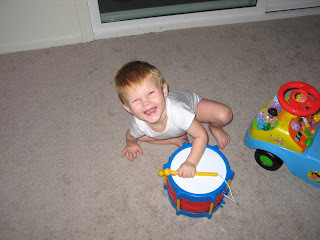 Hi, my name is Landon and I am really excited about playing my drum! 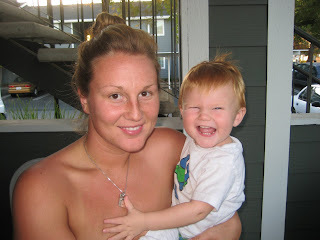 Hi, my name is Landon and I am really excited to be taking this picture with my mom! I love this ridiculous new smile. It is very contagious.